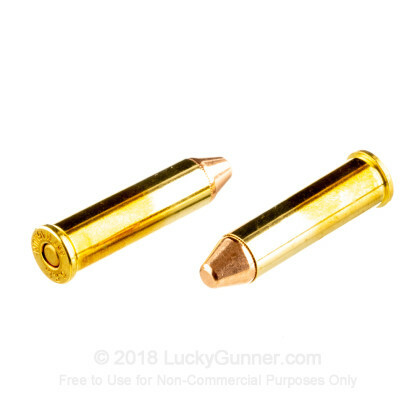 This 357 Magnum handgun ammunition is perfect for volume shooting at a reasonable price. These cartridges are equipped with a full metal jacket truncated cone projectile, resulting in more accuracy at longer ranges. This ammo has a muzzle velocity of 1,420 fps. Fiocchi Shooting Dynamics has a legacy of providing quality and innovation with every product. 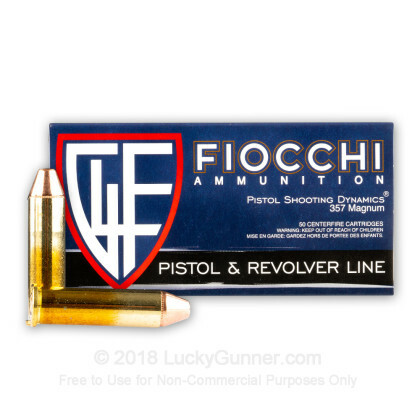 With a vast array of ammunition options, Fiocchi has what you are looking for. Get your bulk ammo today! The Italian ammo company Fiocchi has been around since the 1870s, and is still in the Fiocchi family today. They make a wide variety of ammo for self-defense, hunting, planking, and long-range precision shooting. Among these is several different revolver loads in 38 Special and 357 Magnum. For this review, we're going to take a closer look at one of their more interesting Magnum loads. One of the things you might notice about this 142 grain Magnum load is the long bullet designation on the box, the FMJTC. This stands for full metal jacket truncated cone. Just like the name suggests, this bullet is shaped like a cone that's had the tip cut off. Some believe this shape provides a little more accuracy over a traditional round-nosed bullet, and the flat tip also makes them safe to use in lever-action rifles with tubular magazines. We tested accuracy from 15 yards, using a 4-inch barrel Ruger GP-100, and got a really nice ten-shot group, despite the temptation to jerk the trigger through the stiff recoil of the Magnum load. The velocity for this round is pretty high for a bullet of this weight, giving it a muzzle energy higher than any other 357 Magnum load that we've tested so far. This translates into pretty significant recoil in most guns. It's manageable in a full-size revolver, but pretty painful in a snubnose, like our Ruger LCR, and I could only handle a couple of rounds. Aside from the recoil, the Fiocchi round functioned great all six of our test revolvers with reliable emission and clean extraction with every round. This accurate, high-velocity Magnum cartridge is a great choice for long-range target shooting or planking. 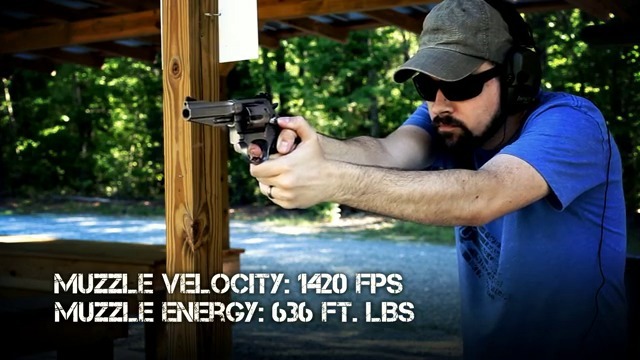 It's also a great load if you want to see what your long-barrelled revolver or rifle is really capable of. Shot very nice groups at 25 yrds with GP100 - 6in barrel. I had shot cheap 357 earlier in the day and this was noticeably cleaner burning and more accurate. I found my range ammo. The heavy GP100 handled the recoil like a dream. This is a solid round! I purchased two 50 round boxes. The other box was Mag Tech from Lucky Gunner also & I highly recommend the people at L.G.. The Fiocchi seemed to have a little bit more recoil than the Mag Tech semi Jacket flat lead 158 grain. Both are good for Home Defense, however, I chose the Mag Tech due to the bullet flattens out to the size of a dime which with my thinking makes it a bit better for Home Defense without going through the entire house. The Fiocchi 357 Mag round would, in my opinion, go straight through my house walls and could be an issue penetrating other houses in the neighborhood. I had no issues with either brand. I shoot with a Colt 357 Magnum Mk111 Trooper with 4" barrel. Both are good rounds and I did not find either to be excessively dirty, no more than the Remington brand. Clean, accurate and kicks like a mule. I use these in a S&W Performance Center 627 that is less than a year old; cleaned after every use. I find these bullets to be extremely dirty and have had too many FTFs to give them a recommendation. Instead, I consider averaging 1 per 8-round cylinder to warrant a warning not to buy. They are cheap and you get what you pay for. I wish more people would post their experiences with 357 ammo using a lever gun. In my Marlin 1894, this stuff cycled perfectly. For range purposes, would not want to fire a lot of this ammo in a 4" pistol, and definitely not in anything shorter. Quite a hot round. I have been testing several different types of ammo with my S&W 627 V-Comp and this is my favorite. Clean and on target. 1 inch groups consistently and I have not experienced a failure in the 500 rounds I have shot with this ammo. No Failure To Fires! The Chiappa Rhino can be a bit particular with what ammo you run through it due to it's unconventional trigger design. I am extremely happy with the performance of this ammo. The appearance exudes quality and when it goes bang it's accurate enough as long as I do my part. The recoil is very manageable (partly due to the low axis bore) and the flame and report let you know you are shooting a .357 round. The cases ejected from the cylinder cleanly too. What can I say, this is great ammo. Lucky Gunner continues to impress! Honestly could not tell the difference. I think there a number of variables in play here. My first .357 was a Python (yes, I let it get away). I have never had another revolver in my hand that could compare including my current GP100. Second, I don't think I have the ability to make a fine distinction between ammo; for example, I could not feel or see any difference between the 142 gr fmjtc and another brand of 158 gr fmjfn. The video said the truncated cones were heavy recoil and actually painful in a small revolver. Another reviewer said they were perfect for his lever action carbine so I was ready for some slamming recoil. Just wasn't there, at least not in a GP 100. I had a great time at the range. Zero failures for my first and so far only box. Groups aren't impressive, but that is mostly my fault. I had just put a new elevation screw in the sight and was bench resting at 25 yards, single action. Great price, excellent service, for a quality product! 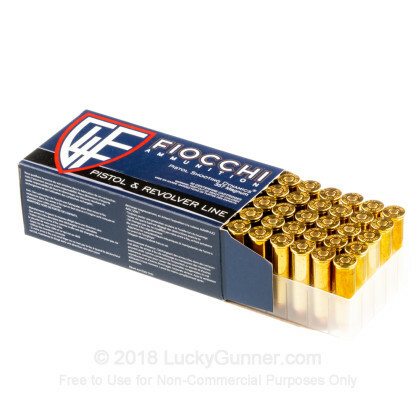 My local Army Navy store turned me on to Fiocchi ammo, but the prices here can't be beat IMO. Surprisingly fast and courteous service, definitely will do business again with Lucky Gunner. Time to stock up on .38 special next. I have been to the range twice running this ammo through my new S&W 627. I put a hundred rounds through it each trip. Both trips I had one round not to fire. Clean contact to the primer. Accuracy is good. Price is good. Of all the dozen or so varieties of ammo I've shot through my lever guns, this is my favorite. It is powerful but has a much smoother recoil than any other round I've used to date. The recoil in my Rossi 20 inch lever gun was more like 38 special than .357. - it was more like a hard push than a jolt, and is actually pleasant to shoot. It just feels "right," at least in my gun. I don't know loading science well enough to give the correct technical terms, but you will know what I mean when I say that some loads just feel more suited to a specific gun. The other point I really liked with this was how flat it shoots. Not bothering to re-zero the scope from using 38 special, my shooting buddy and I were both able to punch 1 inch groups at 25 yards all day long, and I was even able to hit a random target left on the range at 75 yards with the first shot with no holdover or windage. No other round I have fired through this gun was that consistent in flight over that range. I haven't tried it in a pistol or my mare's leg, but after only half a box this became my favorite round, and I now buy them in the 1000 round lots - almost as cheap as 38 special, and a very good round for the price (maybe any price). Not sure I would use it as a carry round, but for the range, I have yet to see anything better in a long gun. I have to believe that the truncated cone bullet shape contributes greatly to that, and the powder load seems very well thought out. I know at least one other, more experienced, shooter who considers this his favorite load as well. I recommend you try a box if you shoot lever guns in .357. I think you will be pleased. I bought this ammo for the price and did not have time for reloading. The first box I just used for plinking and had no issues. The next time out I put some on paper. It is more accurate than I am. Shooting cold I put six rounds within a 1" group (1 careless flier) @ 15 yards using a Ruger Security Six with 6" barrel. I am confident I can tighten the group. I had been shooting some old hand loads that were all over the place, bad lot of bullets I think. I am quite satisfied and looking forward to becoming a better shooter. Powerful, accurate and clean ammo! Used it in snub nose. Had no problems at all. Kinda enjoyed watching the flame shoot out of the barrel too! I really like this brand of ammo. Every time I buy it in whatever caliber I'm never dissatisfied. Order received quickly and in good shape as usual. Your service and selection are top of the line I recommend you to my buddies keep up the great work . Bought these for my Rossi M92. Loved the bullet profile for the lever gun. Had a problem chambering the round. The case is just a little longer than other types which feed well. Also, quite weak power-wise. I'd like to know what barrel they chronographed them from. Good quality, very clean burning. Now....if they'd just shorten the case and add 10% more powder......I'd buy them for the rest of my life!! In my earlier praise of this Fiocchi ammo I neglected to mention Lucky Gunner's careful packaging and prompt delivery. I've also requested information by phone and received a thorough and courteous answer. A .357 mag at this price is fun to shoot with a clear conscience -- unless of course you have more money than you know what to do with. The rounds are good to look at, carefully assembled and easily extracted, which, as extraction goes, is not true of the more expensive American Eagle mags I've used. I'm a mediocre shot -- a comment regarding accuracy would useless. My revolver is a Dan Wesson 715, recently manufactured. A peach of a gun by the way. I have a Taurus 627 6" revolver and bought these for range use. 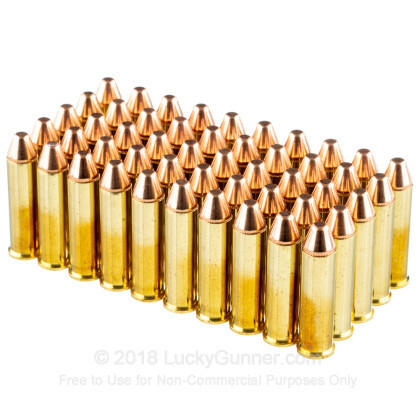 These 142 grain .357 Magnum loads are tack-driving accurate - moreso than wadcutters, JHPs, FMJ round nose loads, and JSPs I've tried from many manufacturers. On a cylinder full of 7 of these, I printed a solid 2" grouping (from a sandbag rest) at 25 yards, which is much better than my recent results with other brands (Remington, Federal, Winchester). After 25 rounds, I had managed to chew a ragged roughly 3" hole in the center of the target. They burn clean, but boy oh boy do they burn! The flame and report from these rounds is FIERCE. At an outdoor range earlier this afternoon, others around me stopped shooting to watch these rounds and the resulting trail of flames cook off. The rounds drop into the cylinders nicely from HKS speedloaders due in large part to the truncated cone bullets. The casings extract clean with a stiff stroke of the ejector, but they do fire form to the cylinders moreso than some other brands. These rounds all ignited on the first strike. 100% went bang every time for 200 consecutive rounds. Recoil is middle of the road on the spectrum of .357 rounds (I consider .357's spectrum to range from stout yet manageable recoil on 158 grain American Eagle JSP to insanely uuberpowered and uncomfortable to shoot Buffalo Bore 125 grain). Also... reloaders, the brass on mine are headstamped HRTRS - they're from Herter's. The brass works nicely with repeated taper crimping and light roll crimping. The primer pockets are durable enough for multiple reloadings. This is a round that I feel pairs nicely with my revolver in terms of repeatable accuracy, reasonable felt recoil (as far as .357 magnum goes), cleanliness (scorching around the cylinder gap & crane was pretty intense, but cleaned off easily with some Hoppes #9), and bang for the buck. It's one of the cheapest factory brass loaded .357 cartridges available, but this stuff is seriously good to go. Highly recommended for target use or hunting applications. NOT recommended for a nightstand/home defense gun due to tremendous flash and report. I've used it in both my Marlin .357 rifle and my automatic Coonan .357 Mag pistol for target practice. No problems. Prices are great, my first purchase with Lucky Gunner. Customer service was outstanding look forward to doing more business with you. Shot >300 rds with no problem. Able to shoot a 3" group of 5 at 25yds. Shot 100 rounds consecutively under 20 mins in my 686P with good accuracy using 5 Star 7 shot speedloaders. Excellent ammo already bought another 1K. Will buy more. Highly recommended. LUCKEY GUNNER did a great JOB!! Q: Are these rounds corrosive? There is no statement regarding this particular information, and that needs to be changed. A: Hi, The Fiocchi ammunition is Boxer-primed. Boxer primers are non-corrosive. Q: What are the bullets made out of lead and copper? A: Hello James! 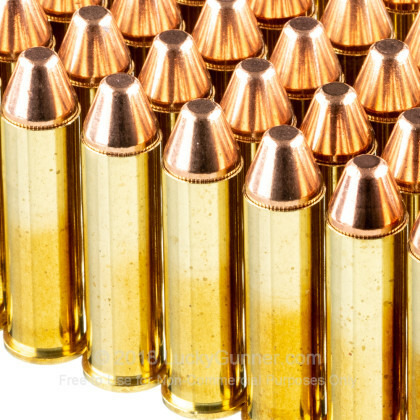 This ammunition is loaded with a copper jacketed, lead core projectile. A: After 1000 rounds of any ammunition, there will be a significant amount of carbon fouling. However, as you have already discovered, Fiocchi ammo is fairly clean burning. 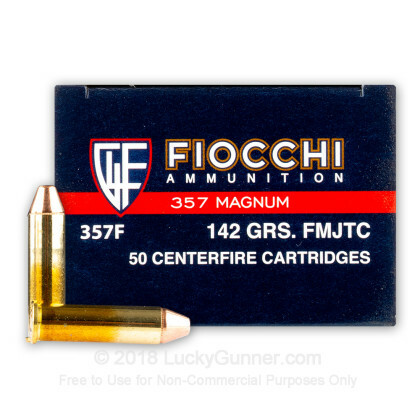 We also have this 357 Mag - 142 Grain FMJTC - Fiocchi - 50 Rounds ammo in stock in a smaller quantity.